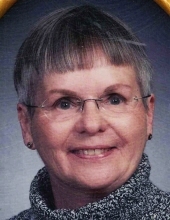 Beverly Ann Meierbachtol, age 78 of Henderson, passed away on November 1, 2018 at the Minnesota Valley Nursing Home in Le Sueur. Funeral Service will be at 11a.m. on Tuesday, November 6 at Trinity Ev. Lutheran Church in Belle Plaine. Rev. Tim Redfield will officiate. Visitation will be from 4-7p.m. on Monday, November 5 at the Kolden Funeral Home in Belle Plaine, and one hour prior to service time at the church on Tuesday. Interment will be in the Schlegel Cemetery after a luncheon at the church. Beverly was born on April 18, 1940 to Fred and Lucille Kipp in Jordan, MN. She was baptized and confirmed at St. Paul Ev. Lutheran Church in Jordan. She married Milton Meierbachtol on September 10, 1966 also at St. Paul Ev. Lutheran Church in Jordan. Beverly worked at Anchor Glass for 42+ years as an environmental administrative assistant. She enjoyed gardening. Beverly is survived by her husband, Milton; and preceded in death by her parents.